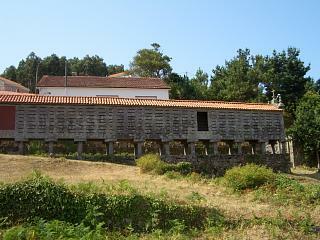 Horreos (stone grain stores) are a very familiar sight across Galicia and most are anything from one and a half metres in length to about three metres in length. There are of course exceptions to this generality and a very large horreo at Carnota (in la Coruna province) is featured in numerous tourist guides. You can see some photographs of it on Galicia Guide. 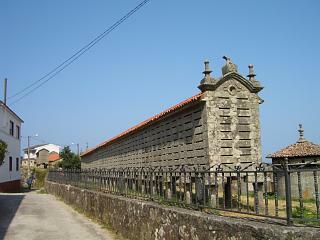 Although the very large grain store in Carnota is possibly the most famous in Galicia, a similar and equally large horreo can also be seen just a few minutes drive away in the neighbouring coastal town of Lira. This horreo sits close to the C550 highway and just above a church and cemetery and was, in our opinion, just as impressive as that of its more publicised compatriot. The horreo at Lira is several metres long and typically narrow with a construction comprising of grey granite stone. 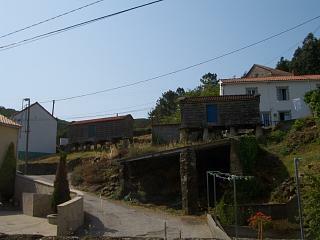 It is certainly worth taking a look at if you find unusual Galician structures like horreos and cruceiros interesting. Also close to the horreo is small circular tower like structure which we assume has a connection of some kind with the grain store. What is was we could not determine. There is a small church below the horreo, but little else of tourist interest in the town. Abovet, a view of some smaller grain stores in Lira. The massive horreo in Carnota is only minutes away.